Parrish Dobson has been photographing for over thirty years. She works unobtrusively, holding great respect for the mysteries of light, moment, and place. Both her color and black and white work have been exhibited and collected throughout the United States. 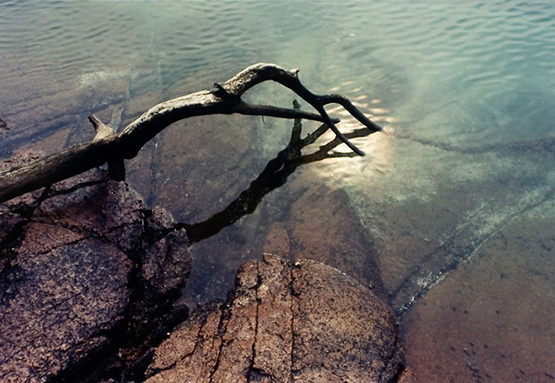 This website includes selections from her extensive color portfolios of landscape photographs made in the Penobscot Bay region in Maine, "Events of Light", and her most recent series, "In Between." Her black and white landscapes, finely printed on silver gelatin papers, include a body of work called "Places of Memory." Made in France and Italy over the past ten years, these images are united by their poetic exploration of voices of the past, the sense of lives lived long ago, still sensed in the present. "Inside Time" explores interiors of a 400 year old chateau in France and fragments of frescos from France and Greece. Another series, "The Touch of a Distant Hand" places before us simple kitchen objects and tools from years past, chosen for the beauty of their design and the patina of use. "An Urban Wild", explores a narrow piece of conservation land in Belmont Massachusetts. Sadly, the adjacent small hill of silver maple trees has now been destroyed by the development of a 290 unit apartment complex. These photographs look at the tangled beauty of a small piece of wild in the heart of the greater Boston area.